After riding the new TVS Apache RTR160 4V at the Company’s Hosur plant, we got a chance to test the motorcycle in real life conditions, and for a longer duration. Before you watch the video review, let us give you a quick recap of the motorcycle. 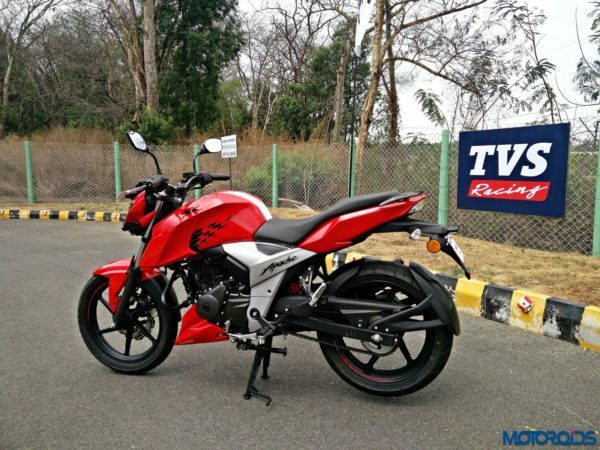 The new 2018 TVS Apache RTR160 4V does not replace the standard TVS Apache RTR160. Instead, it’s a completely new motorcycle with a four-valve engine for better performance. The model was launched in three variants which include a carburetor with front disc, carburetor with front and rear disc and fuel-injected with front and rear disc. The 159.7cc four valve engine is capable of producing 18.8 hp (16.5 hp for the Carb variant) and 14.8 Nm of torque (same for both the variants). This engine continues to be mated to a five speed transmission. Styling cues are borrowed from the TVS Apache RTR200 4V which was inspired by the Draken Concept. The new Apache RTR160 4V comes with a chiseled fuel tank, conventional halogen head lamp with LED DRLs, LED tail lamp, fully digital instrument cluster, and a double barrel exhaust.